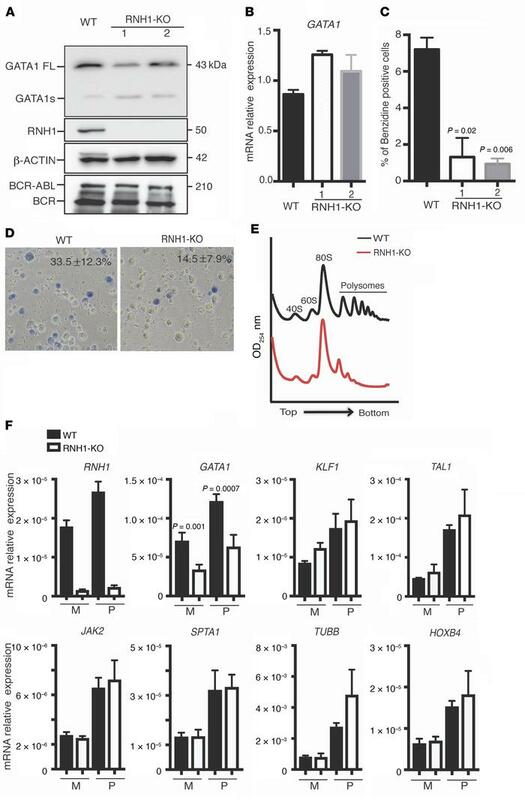 RNH1 deficiency decreases erythroid differentiation and GATA1 protein levels in K562 cell. (A) Total protein lysates of WT and RNH1-KO K562 cells were analyzed by Western blot with the indicated antibodies. K562 cells were positive for BCR-ABL oncogene. Blots are representative of 3 independent experiments. (B) qRT-PCR analysis for GATA1 mRNA levels in K562 cells, normalized to 18S rRNA expression. Data are shown as mean ± SD and are representative of 3 independent experiments. (C) Number of benzidine-positive K562 cells. Data are shown as mean ± SD and are representative of 3 independent experiments. (D) K562 cells were treated with hemin (25 μM) for 3 days and analyzed for the presence of benzidine-positive cells. Data are shown as mean ± SD and are representative of 3 independent experiments. Original magnification ×200. (E) Polysome profiles for WT and RNH1-KO K562 cells. Data are representative of 3 independent experiments. (F) qRT-PCR analysis for indicated mRNAs in monosome and polysome fractions derived from WT and RNH1-KO K562 cells, normalized to 18S rRNA expression. Data are shown as mean ± SD and are representative of 3 independent experiments. P values were determined by 2-tailed t test.